There are certain publishers that have earned my attention whenever they publish a new game and Daily Magic Games has done just that. All of their games are visibly spectacular, but what I love most about the games I have played of theirs so far, is their elegant simplicity without taking away strategy. Thieves Den is no different in these regards. The art is stunning and immediately drew me in. I wanted it to be a game that could match the art, and it certainly did. The theme behind the game is that you are a master thief vying to become the crime lord of the city by amassing the most treasure, thereby earning the reputation needed to run the best crew. 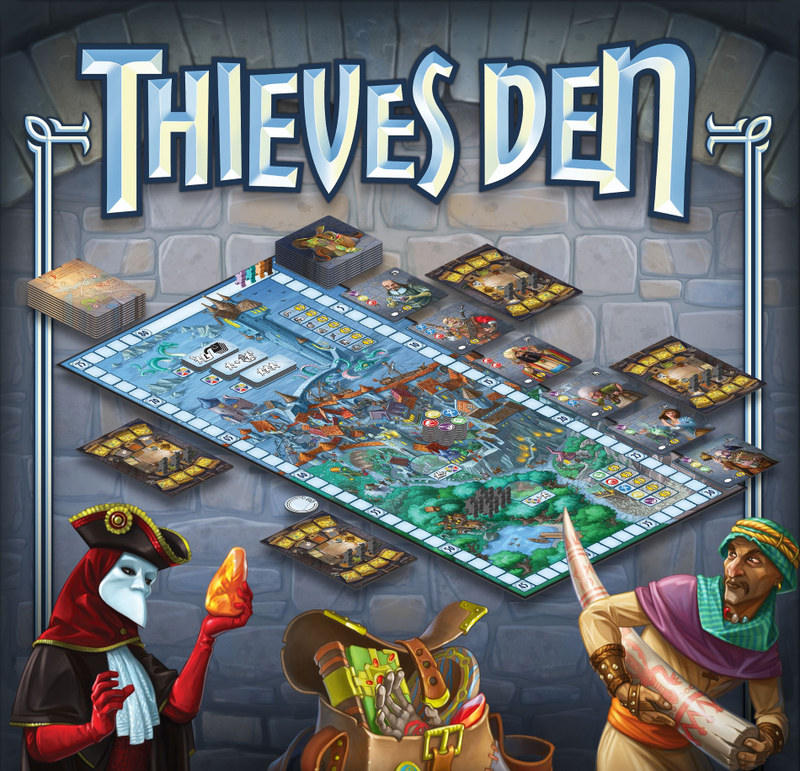 Thieves Den is a mixture of card drafting and worker placement. At the beginning of each round players draft 3 locations that will either be placed in front of them to be used during the worker placement phase, or used for an instant effect. During the worker placement phase players may use any of the chosen locations (or static locations on the board) to use the ability or claim the resources available therein. Players may use any of the locations drafted by the players that round, but if they do the player who drafted the location gets a bonus. This provides a nice balance in drafting cards, not only for your own use, but also hoping someone else will come and get the resource you need. In addition to the locations you draft, players may also send their thieves to the fences to sell treasure they have accumulated in exchange for reputation. Thieves Den is also a game of balance. You are limited in how many thieves can be in your guild as well as how many treasures you can store. Because of this timing plays a major role as to when you can do what. The better you are at resource management, the better you will be at gaining reputation. I’ve often described games as a specific game mechanic, but with a purpose when a game takes a common mechanic and gives you a reason beyond doing it other than gaining points. I will forever describe Thieves Den as card drafting with a purpose. 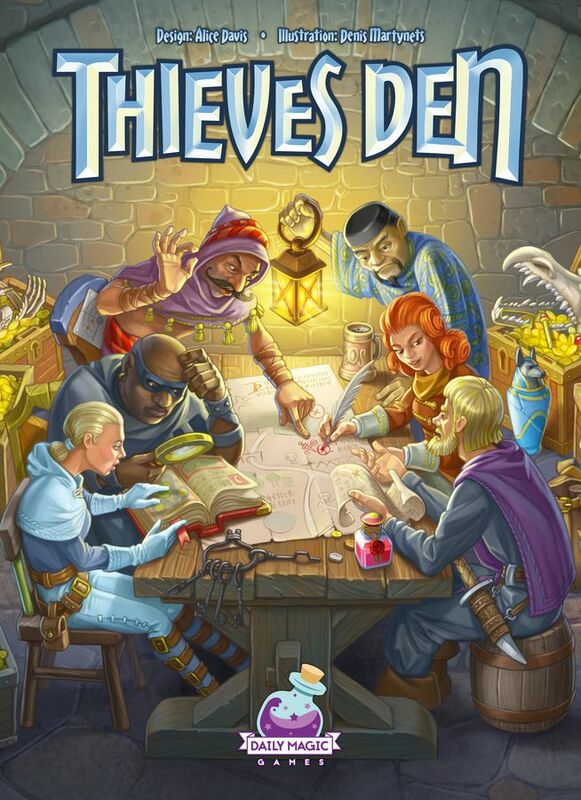 Other games have certainly given a purpose to card drafting, but Thieves Den does an exceptional job in giving you more reasons to draft a specific card than merely set collection, though that is part of it. There are multiple decisions you have to make when drafting a card, including to which set does it belong, what reward will I get if I don’t use it, what reward will I get if I do use it, etc. Overall I really enjoy Thieves Den, I just have one complaint. It’s too short. I wanted the game to be a little longer, partially because the set collection aspect would shine a bit more, but also because I enjoyed the game and wanted to go another couple of rounds. Disclaimer: Please note that all the pictures above are of a prototype of Thieves Den.